With the ambition of becoming the sole conventional lighting manufacturing plant network in the world, Philips Lighting, the global market leader in the development and production of lighting solutions, knew it had its challenge cut out. Its operations in Turnhout, in the high-wage country of Belgium, need to work as efficiently as possible to help the company enter the Industry 4.0 evolution and realise its aim. The concept of Lean manufacturing has already been implemented at Philips Lighting and employees are accustomed to looking for and introducing new ways to eliminate waste and improve processes. The old PDA (personal digital assistant) being used to monitor and carry out preventative maintenance tasks on up to 200 machines in the Turnhout facility was not just slow and unwieldy, but tasks were hard to manage. It also couldn’t be easily adapted to include new items – or delete obsolete ones –, could only record current measurements, which then had to be downloaded for reporting at a later stage, and offered no historical data. It simply wasn’t up to the job. 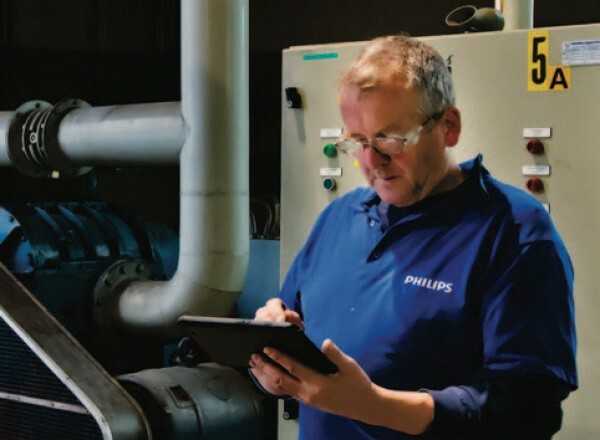 Together with software developer Proceedix, PwC proposed a solution in the form of a smartphone and tablet featuring an app that allows Philips Lighting’s utility operators to carry out required preventative maintenance tasks. Rather than simply proposing a generic, off-the-shelf system, the three parties sat together to discuss what the app needed to be able to do to meet Philips Lighting’s particular needs, co-creating the result. Fully in line with the client’s Lean approach and contributing substantially to its efforts to increase quality and performance in its manufacturing operations, the solution improves efficiency and lowers costs in a Lean way. Eliminating the need for reports to be created after machines have been monitored is just one area of waste that has been eradicated. As a result of the new solution, operators estimate that they already save up to an hour a day, time that they can now spend on more value-adding activities. The next step will be for the app to be extended to include maintenance activities. Step-by-step instructions of tasks to service the equipment will enable operators to carry out some maintenance tasks themselves, allowing Philips Lighting to reduce the maintenance service agreement it has with the supplier of that machine. Strict authorisation protocols will be put in place to make sure that suppliers can only access data regarding their machinery. It may also be used for additional tasks, such as analysing breakdowns and making improvements as well as for areas close to maintenance, such as quality processes and operator procedures. Ultimately, Philips Lighting could enjoy a paperless factory at Turnhout.